JoAnn Corley-Schwarzkopf | NewSchool Management: Anything In Life -- Begins Here! Anything In Life -- Begins Here! I believe every human being has a life force that is the source that guides, influences every area of their life. I wrote a simple handbook to explain this belief and lay the foundation for living from and leading from this force. This is no "woo woo" book. It’s practical information for individual contributors and corporate leaders. Make no mistake about it; anything that is accomplished personally and professionally, individually and with a group requires a force of some kind. Some call it energy, motivation or passion. It is my firm belief that seeing and understanding this is essential to getting more of the outcomes we want in all area of our lives. It’s also necessary if companies want to be and stay competitive. In my view force equals profits and the source of profits begins with the force of each individual employee. So many leaders have limited knowledge if any of how to access or leverage this force. In fact I’ve witnessed many who squander, sabotage, and suppress this force, contributing to the very problems they wish they did not have. Yep this force has a lot of power – the power to make or break a company, to make or break a life, a family, a community. The best news ever is the force is with you – more specifically the force is within you - what will you do with it? What have you done with it? I remember during my childhood becoming aware of a powerful force within me - let’s call it energy. This energy would surge up in me in undeniable ways in which it was hard to control - it would drive me, compel me to say or do something! 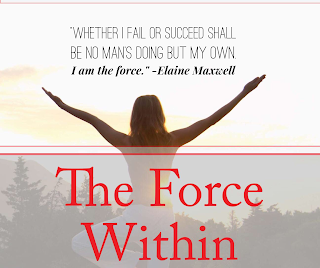 As I matured and became involved in personal development I came to see that force as my authentic personal power. That surge of energy I came to see as my spirit, my voice demanding to burst out onto the stage of life and from an early age that's exactly what it did! That inner force continued to compel me to initiate first, act when others wouldn't or hesitated...and there I was - out in front. That resulted in not only being compelled to lead from the inside-out but being appointed or asked to lead. I learned that once you're out there, folks just keep asking you to stay there. I remember I was teaching swimming (had my own classes) at the age of 14, writing very opinionated letters to the congregation as one of the youngest ministry leaders in my church at the age of 15. It was clear early - leading wasn't what I did, it was who I was. I soon learned through college and into my early working years that leading, that is the willingness to initiate and put myself out there would serve me well and I must say was a lot of fun! It was easier to build relationships, get cool assignments, and stay employed. Certainly, there were periodic employment gaps, but luckily not for very long. When I finally launched my own company in 1998, acquiring clients like many companies was a challenge, but in retrospect not nearly as hard as it would have been had I not been an "out in front” kind of person during my career. All along, every step of the way - that force - that surge of energy was ever present, unwilling to be denied. The force continually pushed me to be out in front. My force was voiced through the behavior of leadership. Oh yes there were times I tried to suppress it. Sometimes it was just darn annoying. I wanted it to be quiet - to allow me some rest. But it wouldn't! There were also times it didn't match what was going on around me. When expressed I appeared odd or going against the grain and even invited ridicule causing much heartache. And yet, it was ever relenting. I could only hold it in, modify it's authenticity, ignore it for logical reasons for only so long. It would have none of it! To this day it keeps asking to be acknowledged and expressed. The result of which has been service in ministry, coaching, speaking, writing and other roles. What I've finally learned and come to peace with is to let my inner force be the leader. I am surrendered to let that inner force and voice lead me so that I can lead others; to let it speak as loud and unique as it needs to for my full purpose to be holistically and completely expressed. Ever heard of the quote, "Don't die with your music still inside you"? It's like that - don't continue to exist with your voice not heard. It was given to you for a reason! I remember seeing the singer Pink interviewed. Here's a quote I'll never forget. She said, "I don't let anyone speak for me, I have too much to say." Imagine for a moment if our many heroes and heroines, inventors and thought leaders allowed their force and voice to be modified or suppressed...where would we and our society as a whole be? Consider: Gandhi, Rosa Parks, Gloria Steinem, Joan of Arc, Madam Currie, Thomas Edison, Harriett Tubman, Elizabeth Stanton, Shirley Chisholm, Steve Jobs, Abraham Lincoln, Nelson Mandela, my mom Marquerite Robinson, just to name a few. Though this list includes both men and women, how are women fairing in the expression of their unique voices? Well, according to her latest best seller, Facebook COO Sheryl Sandberg expressed from her perspective, women are still tempering, modifying, undermining and even discounting their voices. This suggests that in every era there has and will be (particularly for women) a fight to express their authentic voice. Maybe that reflects a DNA conditioning of sorts as women and/or a continued socialization of voice modification or suppression. I wonder for women is it harder or easier now than our mothers and sisters before us? I don't know - perhaps just different. No matter - our success and happiness is dependent on our collective social growth in this area. Honoring all voices is a continuing 21st century human imperative worldwide. Ultimately it begins with the Individual – for each individual to know, acknowledge, respect and allow the inner force to become the outer voice and to not expect it to be like anyone else’s; to protect it rather than compare it to others or temper it to be acceptable to fit in, instead to champion it and allow it's full authenticity to be present and fully expressed, so that it can continually reverberate throughout the precious, short time you’ll be here on earth.